Going green is a massive challenge for everyone: Countries, localities, companies and consumers. When considering a shift to electric power, several issues come up. These include: how to shift to renewable energy when the related technologies (solar panels, windmills, etc.) do not enable a continuous production, or how to continue stimulating an appetite for renewable energy if in parallel the shift to electrical vehicles (EV) results in a dramatic rise of electricity demand? The answers to such questions appear obvious; being sustainable means totally re-working the way electricity is produced, transported and consumed. And the disruption comes first by considering electricity from a stock vs a flow perspective and secondly to strongly rely on hyper-local production. Produce it yourself and share it! The self-production of electricity gradually but surely progresses. Companies invest in solar panels farms to compensate their emissions and consumers that aspire to live in a more sustainable world, cover their roofs with solar panels. These trends are only the first signs of a deeper change. Pushed by new technologies and services, mainly batteries and software, but also policy adaptations; the future is the auto-consumption and a peer to peer trade of electricity. All the technologies that enable this shift are available; everybody can already produce and stock electricity. Today it would be in batteries; tomorrow in another form of energy such as hydrogen. Technically, it is also possible to transfer it (through interconnected smart grids) and to trade it (thanks to Blockchain). Such experiments already exist in a several countries. One example is in Brooklyn, New York, USA. My conviction is that in the future, such “socio-economic” models will become mainstream. Localities, groups of neighbors will organize clusters of houses, buildings and facilities producing and exchanging electricity. And if needed, to back-up or for industries, an additional shared infrastructure will be part of this micro-grid. I mean a solar panel farm, wind mills, batteries or even micro power plants that would produce energy from another renewable energy as bio-gas made with the domestic waste of the population involved. The beauty of the system is in creating the appropriate incentives enabling a virtuous circle. In a nutshell, if you consume what you produce, the net cost will be the investment made. If you consume less than you produce, you can make money by selling the surplus and maximize the selling price in doing so during peak periods. If you consume a lot more, it will cost you much more. As a result, you will be motivated to consume less, and the other partners will be motivated to invest more in production means. It also works with a shared investment in installation of larger production as each member of the group is supposed to consume a portion of energy in relation with its financial contribution to the investment. This virtuous circle could be right now a reality. 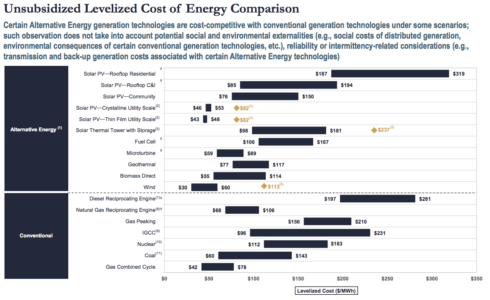 Indeed, renewable is increasingly becoming competitive vs conventional energy according to the world Energy Council. 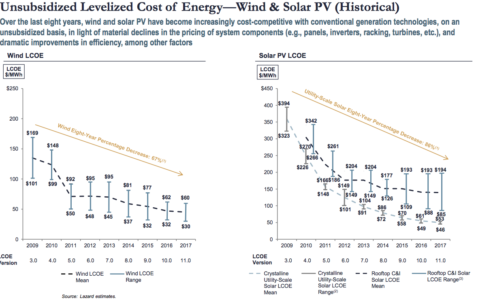 The Lazard’s report also shows that in the U.S., renewable can already be cheaper (see graphs 1 & 2). What about electric vehicles? They are an important part of this model. First, because their relative advantages for sustainability compared to a conventional vehicle massively depends on the energy used to produce it and the energy used to charge it. As a consequence, the electric vehicle industry needs renewable electricity. Secondly, the batteries of the vehicles can be totally integrated in the micro-grid of a home, or of a neighborhood. Being charged when there is a surplus in the greed, or providing electricity when there is a net demand not compensated by the energy available in the micro-grid (production and batteries). To conclude, what we are describing here is a way to gradually answer to a growing demand for renewable energy while creating the appropriate incentives. In addition, it is also a solution to the potential power demand increase to fill electric vehicles. It could avoid high investments in updating the grid, especially to connect renewable electricity production means. With this model, the grid is developed locally, resulting in less infrastructure and interconnections and ultimately, less costs. It establishes a network that is more resilient. In fact, a local disruption will only have a local impact. When a weather hazard or backhoe accident happens; the spread of the issue is limited and given the locality of the situation, it may be easier to resolve. Saying this it seems clear that such solutions are key to enable an energy transition in reach countries but, because it is cheaper and easier than creating a full grid with expensive power plants, it also sounds like a best way to bring electricity in less developed regions. And some initiatives in Africa, using solar panels and micro grids to bring electricity in some rural areas, demonstrate that we may not be wrong. By hyper-local I mean a production very close to the final consumer and addressed to a small specific group. This group can be a group of limited people, a neighborhood, a community or a small city and be composed of privates, companies and public institutions. This is an extended version of an article first appeared on UPS Longitudes, a blog devoted to the trends shaping the global economy.